Bubbles may occur in markets for financial assets because demand depends, in part, on expectations about the prices at which they may be resold in future. In this Leibniz we develop a simple mathematical model of the market for shares in the Flying Car Corporation, showing how beliefs about future prices can amplify price shocks and lead to a bubble in which prices rise at an ever-increasing rate. Suppose there is a competitive market for the shares issued by the Flying Car Corporation. Let time be divided into weeks. In week , demand for the shares depends on its current price and the amount by which the price is expected to change in the near future. We assume that, given , the quantity demanded is a decreasing function of , for the usual reasons. We also assume that, given , the quantity demanded is an increasing function of : the more the price is expected to rise, the greater the quantity of the shares that speculators wish to purchase with the expectation of making a profitable future sale. where are constants of which , , and (the speculation parameter) are positive. 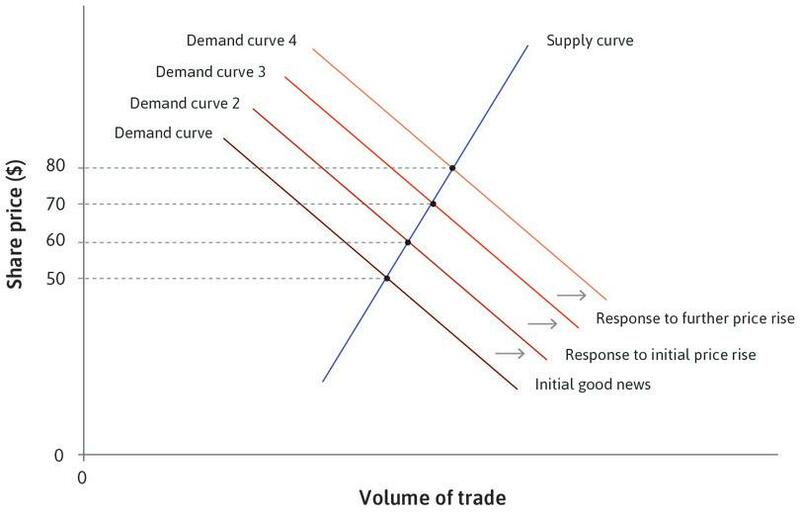 A supply-and-demand diagram, like Figure 11.15 in the text (reproduced below as Figure 1), then plots different demand curves for each value of ; an increase in shifts the demand curve to the right. The beginning of a bubble in FCC shares. Figure 1 The beginning of a bubble in FCC shares. The share price based on anticipated future earnings and the level of risk. Notice that is what the price would be each week if it were not expected to change. We can think of as the fundamental value of a share. 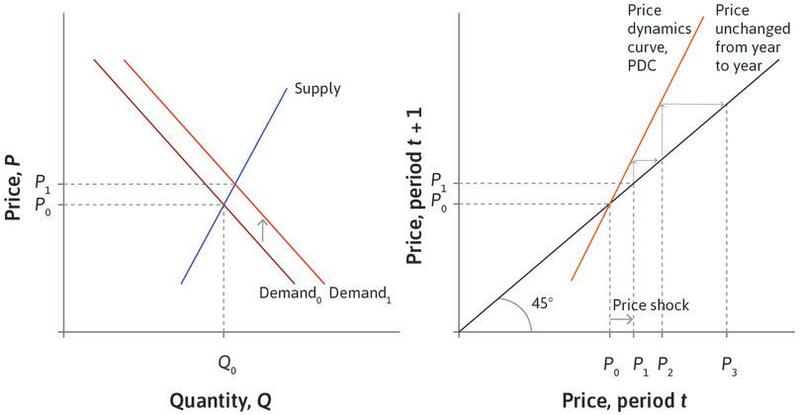 This is the price dynamics curve (PDC) that we discussed in the text. It describes how the price evolves over time. If we begin in period 0 with the price equal to the fundamental value, , and no shocks occur, then the price will remain at in period 1, 2, and all subsequent periods. However, since (which follows from the assumptions that demand curves slope downward (), supply curves slope upward (), and speculation exists (), together with our model for expectations), this equilibrium is unstable. If a shock occurs, temporarily changing the price in period 1 to , then the price will rise again in period 2: the PDC tells us that will be further from the fundamental value than . In the next period it will be higher still. This is the situation illustrated in Figure 11.18 of the main text, reproduced as Figure 2 below. In the diagram, the market is in equilibrium in period 0 (). The PDC, showing the relationship between and , is represented in the right-hand panel. The PDC cuts the 45 line at Since the PDC is steeper than 45 line, and after a shock moves the market away from the equilibrium in period 1, the price rises further in every period. Figure 2 An unstable equilibrium. Again since , we can deduce that the price change gets larger each period: that is, the price grows at an increasing rate. This is the classic example of a bubble: the price rises without bound because it is expected to rise, and will do so for as long as expectations are correct. Similarly, if , the price falls continually by increasing amounts. In this case the model predicts that the price will eventually becoming negative, which does not happen in general. It is possible, however, to construct non-linear versions of this model in which the price remains positive forever, becoming smaller and smaller but never hitting zero. where is the rate of depreciation (). The mathematics then becomes far more complicated, but the conclusion turns out to be essentially the same. For each value of , there is exactly one initial price, say , with the property that if then remains within bounds for all . Otherwise, explodes or collapses. Read more: Section 5.1 of Malcolm Pemberton and Nicholas Rau. 2015. Mathematics for economists: An introductory textbook, 4th ed. Manchester: Manchester University Press. 3.8 Is this a good model? 4.11 Fair farmers, self-interested students? 13.6 Why is consumption smooth? 13.7 Why is investment volatile? 15.1 What’s wrong with inflation? 15.5 What happened to the Phillips curve? 16.7 How long does it take for labour markets to adjust to shocks? 16.8 Institutions and policies: Why do some countries do better than others? 19.3 What (if anything) is wrong with inequality? 19.4 How much inequality is too much (or too little)? 20.9 Why is addressing climate change so difficult?